The Final Post Regarding Steve's Recent Health. I think it's about time that we stop with the rumours. I know that our stories caused you and the people close to you terrible stress. I am sorry for this. I hope you kick the mother******* **** out of whatever is making you sick, and you get better and come back in June strong as an ox and go on to do great things in a third act at Apple. To follow, this will be the last post regarding Steve's health until something definite is released. As i've noticed with many Twitter applications, it's very easy to add more and more features. However, in some cases (Twitterific) this often leads to a decrement in user experience. The solution, as always, is to remove features until you've got the perfect balance. David Pogue likes to refer to the above problem as the "Sports Utility Principle". Whereby, you don't need all the features, but you see as a positive because one day you might need one of these features. However, TwitterFon takes us back to basics. There are 4 tabs: Friends, Replies, Messages and Search. Each of these can have a button telling you how many extra tweets have arrived since you last viewed at that tab. 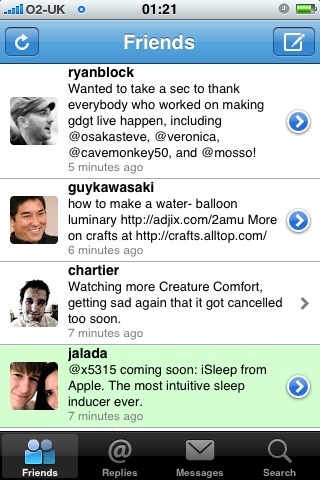 Tapping on a tweet gives you several options: Reply, Send a DM, Retweet, the user's timeline and the user's profile. 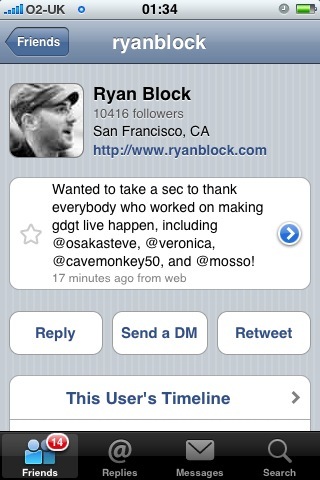 It also gives you access to all the links in a tweet. The application on the whole is very quick, very clean and very easy to use. So what else is so great about this application? It's free. Completely free. If you, like me, have been using Twitterific or Twittelator and thinking that these applications are just too big and heavy then this is definitely the application for you. Once again, the application is free. So what do you have to lose? Apple: Jobs to Take Medical Leave of Absence - Digits - WSJ.com. For Christmas this year i received a pair of Apple In-Ear Headphones. These are Apple's premium headphones. They feature better sound quality, a different design and three sets of silicone ear tips. The silicone ear tips are interchangeable so that you can pick the tips that fit your ears (i apparently have small ears). I find them to be very comfortable like this. The headphones also feature a remote. This remote has several functions. A single click will play/pause the song, a double click will go to the next song, a triple click will go to the previous song and a volume controller. Inside the remote, is also a microphone. This microphone allows you to use the audio recording feature on the current iPods. I've been using these with my iPhone, and have found that all of the controls work apart from the volume controller. 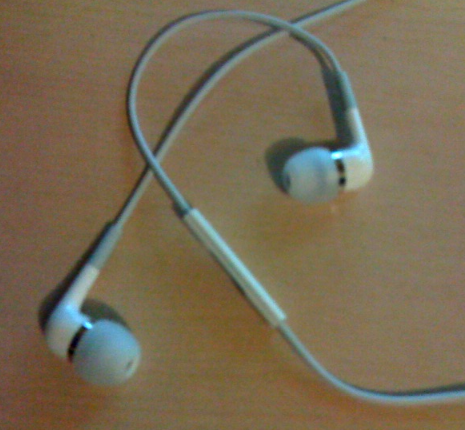 The microphone also works for phone calls and sounds similar to the standard iPhone headphones. Each earpiece features both a tweeter and a woofer. 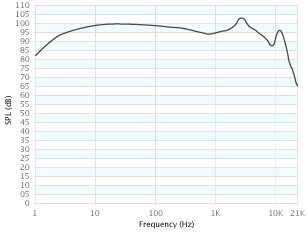 This means that the frequency response is greatly improved over the standard headphones. I've been testing them with various pieces of music, including Led Zeppelin's Dazed And Confused and Stairway To Heaven, Sean O'Riada's Sarabande and Ode To Joy as featured in A Clockwork Orange. The lows feel really warm and powerful, and the highs feel very precise and controlled. The main experience i get from these headphones, over the standard ones, is a sense of depth. They also seem to cancel out ambient noise. While wearing them at my computer, it is almost hard to hear myself typing. This adds the experience as you can really concentrate on the music. Overall, i do believe that these are worth the £55 price tag. They are definitely better than the standard headphones and are probably appropriate for anyone who wants to hear more of their music than they are currently.